Over the last few months we have looked at records you can pick up online for less than £5 or £10. Of course if you are after the digital files you will pick many of these gems up for about £1 or similar depending on your currency. We are working on the UK Pound which of course is going through turbulent times and looking at mostly records you can pick up in the UK. We looked at records that are for sale on Discogs (other sites such as Ebay, Amazon and MusicStack will also have many of these tracks). The lowest rated vinyl condition was set at least VG+ and in this case less than £5 excluding postage. We decided to look at releases of house tracks from the mid, late 1980s to early 1990s on U.S. based labels. Most made their way across the globe and were re-released on European labels, but to keep things interesting we looked were possible at the original U.S release. That means that you will probably find many of these records even cheaper if you are willing to pick up on the re-releases and reissues. So let's begin. 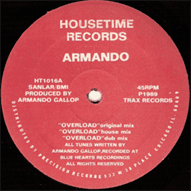 Armando passed away 20 years ago sadly, but left an incredible legacy of superb early house and acid tracks. He recorded this aged 19 years old and by then had already created the sublime 'Land of confusion' two years earlier. Another one who passed away this year, but Peter Black produced a soulful early house track that was possibly never given the credit it deserved. Truly superb release by Tyree Cooper and Martin Luna that still sounds really good a quarter of a century onwards, well worth tracking down. The Dynamic Duo were the two Tommies of Tommy Musto and Tommy Sozzi who switched track from hip hop to house over the course of their four releases. This track still has enough in the tank to drop into an old school house set. One of the most underrated acid tracks of all time, rumbling acid basslines roll over a military style drum track. 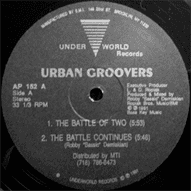 Classic Chicago house and one that is worth the small sum to get a copy of the U.S. original. Hip house meets acid house, with a thunderous beat and samples from the electro classic Al Naayfiysh by Hashim. 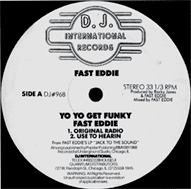 Fast Eddie was one of the main instigators of hip house and one of the few who could do it really well. Quite an intense track and if anything just a little let down by the pressing as was the way with many early U.S house pressings. A relentless rhythm track with the Mike being Mike Dearborn which helps explains its leanings towards a techno sound. Made number one in the UK pop charts and the track to really herald the coming of house scene in popular culture. Still quite a good track despite not hearing it played anywhere anymore, so more reason to drop it into your collection. A typically deep work out from one of New York's finest house labels of the time. 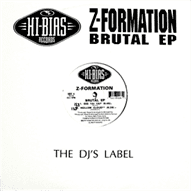 Lively two track 12 inch from another key player in the house scene with Trax Records. An early appearance from Felix the Housecat on keyboards for the 'Off beat acid mix' on the flipside. We cannot have a list like this without the Godfather of House, Frankie Knuckles. The House Mix comes complete with stabs, uplifting vocals and pounding beats that make for an updated version of Teddy Pendergrass's Philly soul-disco anthem from 1977. Uplifting vocal house house by Craig Loftis who was last seen making music under the 'lofty' guise of Grand High Priest. Also released under L Factor and another gem of a track 'Claim to be' on Rhythm Beat a year later. More vocal house goodness from D.J. International, this time with Joe Smooth on the mixing duties. Quality production again and as real as old school Chicago house music gets. House piano action from Richie Weeks who was also the frontman for the aptly named 80's disco group Weeks & Co.
Also released as Marshall Jefferson as On the House was his good self alongside producer Curtis McClain and vocalist Rudyard Forbes. Sounds not too dissimilar to 'The house music anthem' which dropped just before in the same year. Another early release from one of the forerunners of house music which is quite mellow compared to other releases. The 12 inch pretty much epitomises the early original US house sound. Queen Latifah gets another mention in our bargain lists with this hip house outing that features mixes from Julian 'Jumpin' Perez and Fast Eddie. Another prolific producer of the time, Rosario started DJing back in the late 1970s and was regarded as one of the small band from Chicago to coin the term 'house music'. Running away pretty much captures the classic house sound of the late 1980s which was starting to die away by the time this release had appeared. We have to admit never hearing this one before and it is a beautiful gem, classic deep house with a quality production and piano riff. D.J. International stalwarts Loftis, Tyree, Joe Smooth and Rocky Jones get down to work on the remix duties. More uplifting vocal house with a bubbling bassline that almost leans towards hip house in its production. More commercial than many of the releases of the time, and had less of an impact compared to its label peers. Taking the main break from the Sheffield classic 'Hustle to the Music' by The Funky Worm, this is a steady house number that has less about it than the aforementioned track, but still worth a listen. 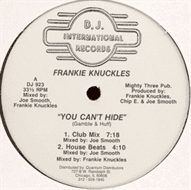 Another of the first wave of U.S. house tracks with Nick Huminsky who went on to release almost two dozen tracks under the White Knight guise. This cheeky little number that has an 'amazing grace' sample proved so popular that Deconstruction picked it up and released it in the UK. Boris Badenough and Farm Boy both recorded under their own guises for Trax, but are joined by Dean Anderson for this venture into synth pop. Lurching towards the European house music of the time with uplifting vocals and pianos that was the antithesis of the much darker, harder sounds that were gaining greater prominence on the dance scene. As with the golden era hip hop list we curated the other week, Z again proves tough, so we slip over the border to Canada to pick up this superb four track ep. Have a listen and tell us we were wrong to include this, we think you will like it. We have really set ourselves up for a challenge in trying to find 26 tracks from a certain scene or time that you can find for a good price, but at Trackhunter we are always up for the challenge. Regardless of your knowledge of house music, the chances are that there will be a few tunes in this list you won't have come across and chances are there will be one or two that you'll want to add to your collection. Most dance tracks do age over time, but some do retain their original vibe and if you are a fan of some of the aforementioned labels then you might be tempted to fill gaps in your collection. Whether it be in the crates or on Trackhunter, good luck digging for those killer tracks, old or new. We'll be back with more bargain lists over the coming months.